Grandes dicas, vale o peso em ouro. 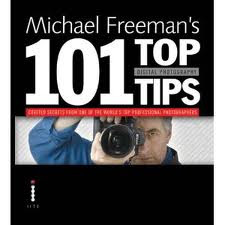 For the very first time, renowned international photographer and author Michael Freeman reveals all the insider hints and secrets that most professional photographers dont want you to know. Photographers of all skill levels point-and-shooters, enthusiastic amateurs, and even fellow professionalswill find plenty of invaluable advice drawn from Michael Freemans many years in the field. 101 Top Digital Photography Tips explains how to use your digital camera efficiently and creatively, and how to think and shoot like a seasoned pro. This book will show you how to make the most of your digital camera, even if your resources are limitedcovering everything from shooting in poor weather conditions, faking complex lighting setups, and shooting for depth of field, to fixing damaged files and organizing your photos effectively. You might know Photoshop inside and out, but if youre not using your camera to the best of its abilities, youre likely to be disappointed with the results. Michael Freemans 101 Top Digital Photography Tips will make sure you get the best possible images to work with in the first place, regardless of your current skill level.